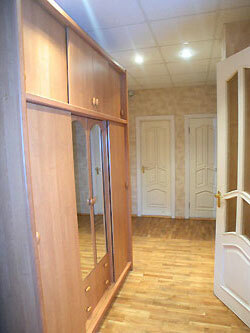 The apartment is located in the heart of Kiev, in Vladimirskaya, street19. The House, where the apartment is, located right on Sophia Square and from all the windows you can see St. Sophia Cathedral. This is a very beautiful historic facade house with arched windows, dress circle. 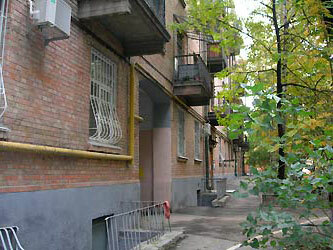 You can enter the apartment from the street as well as from the yard. Near the house there was built a new hotel in high-tech style and parking. All the most important and significant places are situated just in a few minutes from the apartment: 3 minutes of walking to the main square - Independence Square, 1 minute of walking to St. Michael and St. Sophia Cathedral. All the sights are in 5-15 minutes of walking from the house. 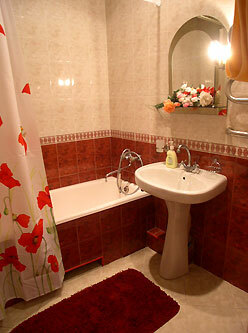 The house has central water supply, hot water round the clock, central heating of apartments. This is one of the most beautiful one-bedroom apartments, which has high ceilings. Its total area is 55 square meters. 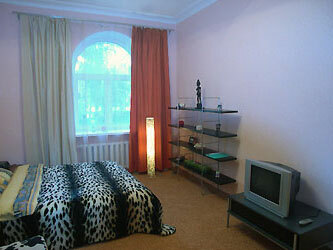 The apartment is fully furnished and there are all facilities for comfortable stay of both tourists and businessmen. 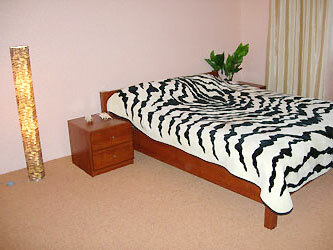 The apartment has 4 sleeping accommodations, owing to the folding double sofa in safari style and the double bed. At your disposal there are cable TV with satellite channels, DVD, cordless phone (local calls only in Kiev are for free), unlimited high speed Internet. The kitchen is equipped with all necessary things. 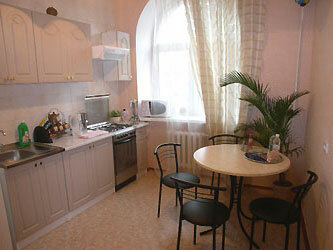 There are a microwave oven, gas stove, refrigerator, kitchen utensils, dining table for 4 people. 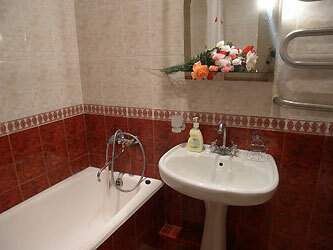 The spacious bathroom is equipped with a classical bath, washbasin. WC is separate. Low season (08.01-30.02) - $ 69 per day. Seasons (1.03-30.12) -77 $ per day. High Season (April 28 - May 8, December 30- 7 January) - $ 95 per night (minimum period of renting is5 days). Long term rent: 1-2 months - $ 1900 per month and more than two months - $ 1700 per month.